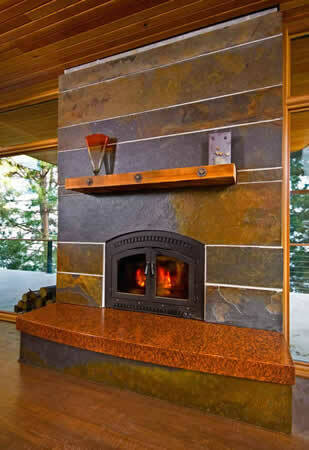 Concrete is an ideal product for your home, whether the medium is countertops or furniture. However, it is important that you understand how to care for our concrete products. This page was designed to answer questions customers have asked in the past. If you have a question that is not answered, please contact us at stampinggroundstudios@gmail.com and we will be happy to respond. How do I maintain my concrete countertops? A common misconception about concrete countertops is that they are high maintenance. We provide our clients with a VOC (volatile organic compound) compliant spray polish that provides a continuous protective barrier. We recommend wiping down your countertops once a week with the polish. This along with the sealer and wax we applied before installation will keep your countertops beautiful for years to come. "VOC Compliant" means that the cleaners must meet the local, state or federal regulations for these products. In short, VOC compliant products are less susceptible to explosions and other fire risks. How do I clean my concrete countertops? Avoid abrasive soaps and cleansers. We recommend a mild, non abrasive, non ammoniated soap. Simple Green (diluted according to label instructions) or a neutral pH cleanser with warm water works great. Although it is rare, concrete countertops can develop hairline cracks. These cracks tend to be non-structural and are a result of natural shrinkage in concrete. All of our pieces are reinforced. We also pour and cure them in a controlled environment, which greatly reduces the chances of cracking. Yes. However, the VOC compliant sealer and wax we use have proven to be the most stain resistant combination. As long as your countertops are sealed and waxed correctly, there should be little maintenance to keep them looking new. Acidic substances (tomatoes, lemons, limes etc..) create the most problems. Acidic substances that are spilled or cut open should be cleaned up immediately to avoid potential staining. Can I cut on my concrete countertops? No. Cutting does not hurt the concrete itself, but it compromises the wax and sealer which makes the concrete susceptible to staining. Stamping Ground Studios recommends using a cutting board. Can I place hot pans on the concrete? No. As with cutting, hot pans don’t directly affect the concrete, but compromise the sealer and wax. We inlay trivets in the countertop next to the stove to alleviate this problem. Not only do the trivets provide function, they also add a nice aesthetic feature.